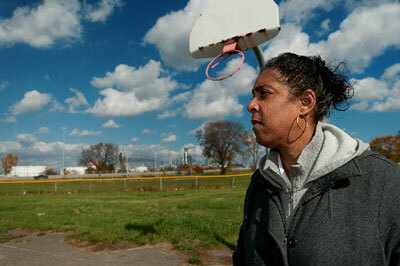 Residents of polluted neighborhoods watch warily as local refineries prepare to process Canadian crude. This story first appeared on the website of the Center for Public Integrity. In an economically distressed pocket of southwest Detroit known by its ZIP code—48217—the weekend of September 7-9 was one of the worst, pollution-wise, residents like Theresa Shaw could remember. “I started smelling it on Thursday,” said Shaw, who immediately suspected the Marathon Petroleum Co. refinery a half-mile from her house. “I kept the windows closed because I couldn’t breathe. On Friday, I thought, ‘What the heck are they doing?’ My eyes were just burning, my throat was hurting, my stomach was hurting. I was having migraine headaches. Shaw retreated to her sister’s house on the north side of town. Responding to citizen complaints, the Michigan Department of Environmental Quality traced the powerful odor to Marathon, which had been cleaning several large vessels, and wrote up the company for a nuisance violation. Marathon says it is “committed to environmental responsibility” and acted quickly to correct the odor problem, a byproduct of plant maintenance. Yet the episode further eroded residents’ trust in the company and underscored their fears about a $2.2 billion refinery expansion that will allow Marathon to process more high-sulfur Canadian crude oil. The build-out, nearly complete, won’t add to the air pollution burden, Marathon promises. In fact, the Ohio-based company vows, emissions of some pollutants will go down and job numbers will go up. Shaw doesn’t buy it. “They’ve disrespected us in this neighborhood over and over and over again,” she said. The conflict in southwest Detroit is one piece of a larger environmental struggle being waged in communities nationwide. At the core of the debate: Plans by a number of oil companies to step up refining of heavier, dirtier crude, much of it from Alberta’s tar sands formation, a deposit whose reserves are eclipsed only by the vast Saudi Arabian oil fields. From the Great Lakes to Texas, people in already polluted neighborhoods are watching warily as refineries grow to accommodate the Canadian oil. Thus far, much of the controversy over tar sands has centered on the environmental damage caused by extraction and the risks of a spill from the proposed Keystone XL pipeline, which would carry the fuel to Gulf Coast refineries. But the next stage in the process has been largely overlooked: The oil has to be refined somewhere. Heavy oil from Canada is already reaching Marathon and other refineries. Between 2006 and 2011, imports of such crude more than tripled. Heavy oil from Canada is already reaching Marathon and other refineries. Between 2006 and 2011, imports of such crude more than tripled, a Center for Public Integrity analysis of data from the US Energy Information Administration found. Some worry that government approval of Keystone XL would accelerate this trend, providing wider access to tar sands. Construction has begun on the southern portion of the pipeline, between Oklahoma and Texas, but the northern section is on hold pending further analysis by the US Department of State. The thick, asphalt-like crude, known as bitumen, requires more processing than lighter forms of oil, which could lead to increases in pollution if not controlled. The burden would fall most often on communities, like southwest Detroit, populated mainly by low-income people of color. Yet the EPA has conducted no evaluations of its own and isn’t keeping track of the refinery expansions around the nation, an agency spokeswoman said in a statement to the Center. The State Department has looked only at the possible impacts of Keystone XL and maintains there is no evidence that the pipeline’s potential approval has prompted any of the current refinery expansions. The department referred Center inquiries to its published evaluations, one of which says significant expansions should trigger rules requiring refiners to install better pollution control equipment. Some advocates contend, however, that companies are underestimating the projects’ air impacts in an attempt to avoid such requirements. Two trade groups representing the oil industry, the American Petroleum Institute and the American Fuel & Petrochemical Manufacturers, did not respond to interview requests, but both have supported increased use of tar sands, arguing that America would benefit economically and secure a more stable energy source. “It’s like a Frankenstein lab experiment,” 48217 resident Theresa Landrum says of living with air pollution from the Marathon refinery. Kirk AllenTypically, the refinery expansions are unfolding in places that have long suffered from air and water pollution. At the end of the proposed Keystone XL pipeline, for example, lie hazy Gulf Coast cities dominated by the petrochemical industry. Last year, the mayor of Houston wrote the State Department, expressing concern that oil companies’ easy access to tar sands could lead to further deterioration of air quality. Refineries in nearby Texas City and Port Arthur have expanded or are in the process of doing so. Health worries abound, with particular concern over asthma and cancer. In July, the Michigan Department of Community Health announced the preliminary results of a study of 48217 and three other ZIP codes in southwest Detroit: Rates of newly diagnosed cases of cancers of the lung and bronchus were “significantly higher” than those in the rest of the state outside of Wayne County (which includes Detroit), the department said, as were death rates. Indeed, data submitted by Marathon to state regulators show that emissions of volatile organic compounds from the refinery increased by 36 percent from 2009 to 2011. The company declined to comment on the increase, saying only that it had obtained “all the necessary permits” for its air emissions from the Michigan Department of Environmental Quality. In exchange for the tax break, Marathon promised to create 60 full-time refinery jobs and 75 full-time contractor jobs, which, it said, collectively would add $16.5 million to the annual $74 million payroll. Even with the abatement, Marathon said, the city would reap $230 million in new tax revenue through 2030. In much the same way, the American Petroleum Institute has promoted the use of tar sands as an economic boon to the United States that would lead to thousands of new jobs. 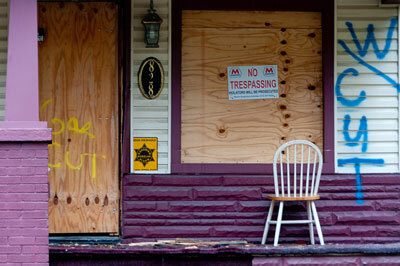 Marathon’s plan was an easy sell in one of America’s most desperate urban areas. Whether it was a good deal remains to be seen. Marathon Petroleum Co. says it has been, and will continue to be, a good neighbor, but some who live near the refinery are skeptical. “They’ve disrespected us in this neighborhood over and over and over again,” says one resident. Kirk Allen“It can’t just be about jobs,” said state Rep. Rashida Tlaib, a Democrat who represents the neighborhoods around the refinery. “My residents and I feel that jobs can’t fix cancer. It has to be about the fact that this massive refinery is living next to a very poor, minority community in Detroit with no real protection. When my residents hear sirens, they cross their fingers and hope it’s not some sort of huge explosion. City Councilman Kwame Kenyatta said he was annoyed that a Marathon representative failed to appear Oct. 1 before the council’s Public Health and Safety Committee, which was seeking information on a Sept. 5 refinery fire. In a statement to the Center, Marathon said it “did not receive adequate notification” of the Oct. 1 committee meeting. The company attended a rescheduled meeting two weeks later and described the Sept. 5 fire as small, saying one employee suffered minor injuries. Kenyatta said he agreed to the 2007 tax abatement only after Marathon promised to share some of the economic benefits of the refinery expansion with the community. Asked to comment, a Marathon spokesman referred a Center reporter to the company’s website. 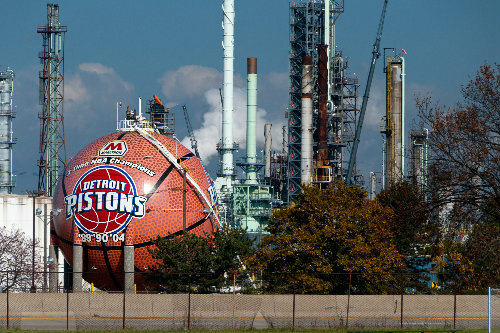 The site says that Marathon, in consultation with the Detroit Workforce Development Department, “has created a workshop that will offer assistance to Detroit residents in taking pre-employment tests” and has committed to offering 10 community college scholarships per year for at least 10 years for those interested in refinery operator positions. Marathon also says it plans to hire “as many Detroit residents…as possible” for the 75 contractor jobs it expects to add once the refinery expansion is completed. Before it could start its expansion, Marathon had to secure a permit from the Michigan Department of Environmental Quality—the MDEQ. On paper, the project looked like a winner. Marathon would be able to run more crude through its refinery, which opened in 1959, and new pollution-control equipment would reduce the poisons released into the air. Emissions of sulfur dioxide and volatile organic compounds, for example, would go down compared to current levels, Marathon said, though emissions of hydrogen sulfide—a gas known for its rotten-egg odor and potentially fatal in sufficient concentrations—would increase. The MDEQ and EPA reviewed the permit and decreed that the project was not big enough to trigger federal “Prevention of Significant Deterioration” rules, which would have forced Marathon to install more controls. The Sierra Club, invited by residents to intervene, won modest concessions from Marathon in 2008. The company agreed, among other things, to additional air monitoring and further emissions reductions. The state and the EPA say the pollution projections in Marathon’s permit are credible, but others are skeptical—citing previous industry case studies. Five years ago, residents of Whiting, Ind., heard similar claims from BP: After it completed its nearly $4 billion refinery expansion to allow processing of more heavy crude, emissions of many pollutants would decrease, the company said. The project, BP said, wasn’t big enough to trigger stricter pollution controls. Staffers with the Natural Resources Defense Council weren’t convinced. After digging through the thousands of pages BP had filed with the state in applying for a permit, the NRDC determined that many of the company’s claims stemmed from “funny math,” said Ann Alexander, a lawyer for the organization. “They both overcounted the reductions and undercounted the increases,” she said. BP assumed, for example, that the three new flares—devices that burn off waste gases and can be major sources of pollution at refineries—it was installing would produce no emissions, Alexander said. The EPA agreed with many of the complaints lodged by the NRDC and other environmental groups and intervened in 2009. In May, the EPA announced that it and the groups had reached an agreement with BP. Among other things, the company said it would spend an additional $400 million on pollution control equipment. BP spokesman Scott Dean, asked to respond to the allegation, said, “We settled that matter to both parties’ satisfaction.” The Whiting project, scheduled to be completed in the second half of 2013, will allow the refinery to process up to 85 percent heavy crude, compared with the 20 percent it currently processes, Dean said. Overall, he said, emissions should drop. Oil refineries have long been a target of state and federal regulators. Since 2000, the EPA has cracked down on the industry under a special initiative focusing on air pollution, collecting tens of millions of dollars in civil penalties and requiring billions to be spent on pollution-control upgrades. Marathon is no exception. In April, the EPA and the US Department of Justice announced that the company had agreed to install “state-of-the-art controls” on flares at its six refineries, ultimately keeping 5,400 tons of pollutants from reaching the atmosphere each year. Marathon also will pay a $450,000 fine to settle alleged Clean Air Act violations. The MDEQ has issued 13 air pollution violation notices to the Detroit refinery since 2001. None resulted in penalties because Marathon took quick corrective action, said Wilhemina McLemore, Detroit district supervisor for the MDEQ’s Air Quality Division. “If they’re out of compliance for a short period, they usually resolve whatever the issue is in a timely manner,” McLemore said. On the other hand, air sampling performed by residents and overseen by Global Community Monitor, an environmental group based in California, in 2010 found high levels of benzene—a carcinogen—and hydrogen sulfide near the refinery. In one case, more than 20 chemicals, including benzene, were detected in a resident’s basement. An EPA investigation traced the contamination to Marathon’s dumping of wastewater into the city sewer system. “We were shocked to learn they did not have their own discharge pipe into a body of water like, I believe, every other refinery in the United States,” said Denny Larson, Global Community Monitor’s executive director. An EPA spokesman said Marathon installed “carbon beds and a peroxide system to remove petroleum compounds from the wastewater discharge” in February of last year. Monitoring afterward showed that the technique worked and that benzene concentrations had fallen to “non-detect levels,” the spokesman said. Larson said he finds it troubling that the state has imposed no fines on Marathon since 2001. He believes the EPA might not have struck this year’s agreement with the company but for the publicity surrounding the 2010 air sampling. In Whiting, Global Community Monitor and the Calumet Project, a local environmental group, made a deal with BP—independent of the NRDC lawsuit—that requires the refiner to conduct what’s known as open-path air monitoring. Instead of measuring chemicals within “three inches of air”and possibly missing large releases, Larson said, BP will use ultraviolet rays to scan thousands of feet along its fence line and post the monitoring data on a public website within 24 hours. No such arrangement is in place in Detroit. Since January, Marathon has operated three monitors on its property and one at an elementary school. The devices have turned up little of concern, apart from elevated particulate levels linked to construction, the MDEQ’s McLemore said. To some residents of 48217, there’s a simple solution to the perpetual tug-of-war between Marathon and a community grown weary of bad air: buyouts. Marathon is acquiring homes in a decaying neighborhood called Oakwood Heights, on the north side of Interstate 75, just blocks from the refinery. Among those waiting for their appraisal in late August were Roland and Linda Wahl, who have lived on South Colonial Street for 38 years. People on the other side of I-75 have yet to convince Marathon to relieve them of their homes. “I want to move,” Theresa Shaw said. When Shaw broached the idea with Marathon a few weeks ago, she was rebuffed. A company representative told her that Marathon was picking up properties only in Oakwood Heights, though Shaw lives about a quarter-mile from the Wahls and breathes the same air. The Center for Public Integrity is a nonprofit independent investigative news outlet. For more of its stories go to publicintegrity.org.